There will be no compromise on Assam's security. Land swapping will be done for a permanent solution, said PM Narendra Modi. Prime Minister Narendra Modi on Sunday announced that his government would not compromise on national security and utilise land transfer agreement with Bangladesh in a manner that it serves the long-term security interests of the state. It might seem to be an immediate loss to Assam, but the state would benefit in the long run, Modi, allaying apprehensions over the Indo-Bangla land swap deal, said. “The government will utilise the India-Bangla land transfer agreement to seal all routes across the international border through which illegal Bangladeshi migrants have been entering Assam and creating havoc in the state,” he said. Addressing Bharatiya Janata Party (BJP) workers here at the end of his two-day hectic trip to Assam, Modi also claimed that his government has been able to convert development into a national agenda prompting all other parties to push issues like caste, creed, religion and language to the back. Asking the people of Assam to have faith in him, Modi said, “There will be no compromise on Assam’s security.” He also promised to fulfil the promises he had made to the people of Assam during Lok Sabha elections. “I know the sentiments of the people of Assam. We will always protect the interests of Assam and the country, he said. Modi however did not make any commitment on the Bangladeshi influx issue and carefully avoided recalling his announcemebt during the election campaign in April that Bangladeshi migrants would have to pack up afte May 16. He however issued a stern warning to forces trying to harm the interests of Assam and the Northeast region and said that law would not spare them now. “Such forces should know that the government has changed in Delhi and the law will not spare them now,” he said. 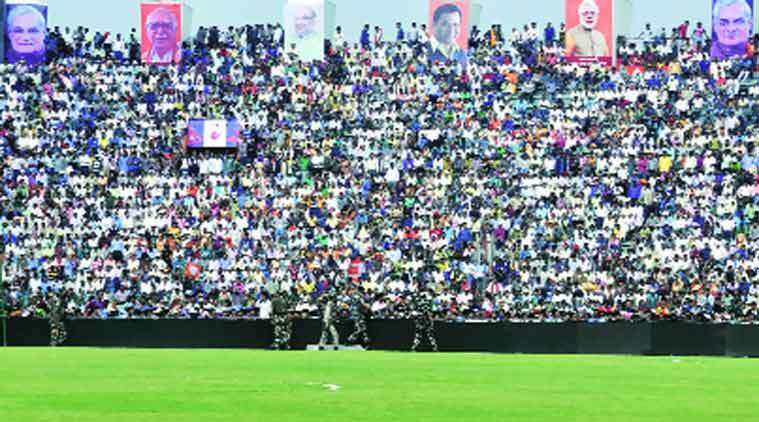 The development of the entire northeast region including Assam was a priority of his government, Modi added. The Prime Minister also claimed that the BJP has compelled all other political parties to make development the prime issue instead of issues like caste, creed and region. “We have turned the issue of development into everybody’s agenda across the country,” he said. The country, Modi claimed, has seen performance and agenda of the government run by all others parties including the Congress, the Left parties, regional parties and coalitions and they have now seen the BJP-led government at the Centre.